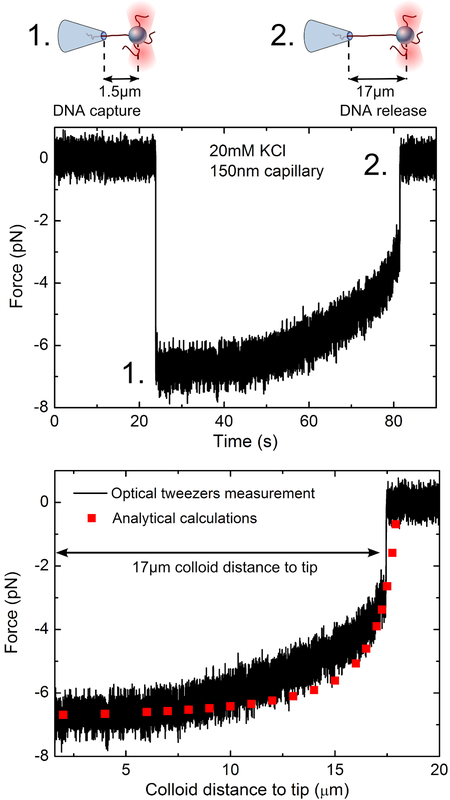 Research Bulletins: Catch a colloid by the tail ! About five years ago, an interesting twist  on the resistive pulse technique emerged from the Dekker lab at TU Delft (Netherlands). Their set up is shown in the sketch on the left. One end of the DNA was attached to a polystyrene bead which is held in place by a spot of laser light: a very useful innovation in nanotechnology known as a Laser Optical Trap (LOT) (aka Optical Tweezers). When a voltage is applied and the DNA starts to translocate, the LOT holds it back and "frustrates" the translocation. As the DNA pulls at its tether, the bead is displaced slightly from its equilibrium position which gives a way to directly measure the force acting on the DNA. 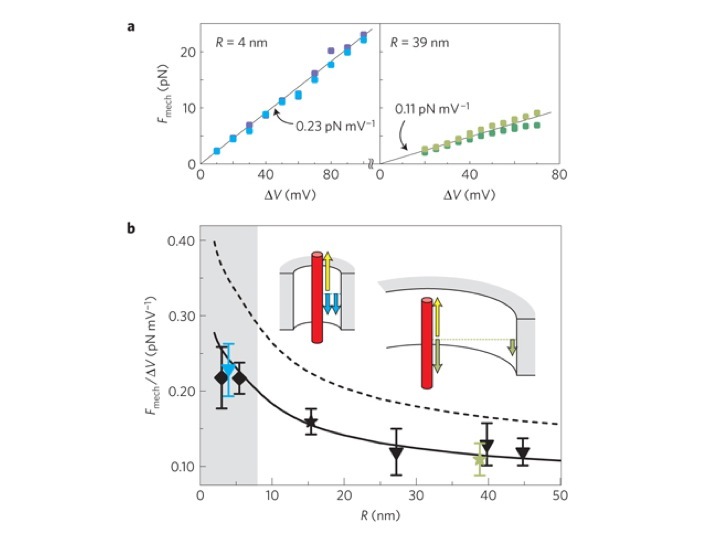 Instead of yielding the translocation time this method yields the "tether force" together with the conductance change of the pore. This set up can be used to test the idea of the "hydrodynamic origin" of the resistive force discussed in my last Blog. I was able to calculate  the tether force using a modification of the theory for translocation times discussed earlier, and this simple analytical formula could be compared with the tether force measurements . This is shown in the panel to the left. The top sub figure shows that the tether force is proportional to the applied voltage. The force per unit applied voltage is plotted in the lower figure against the pore radius (R). The data shows quite clearly the 1/ln R dependence of the force predicted by theory. The dashed curve is obtained if the DNA "bare charge" is used. The solid curve is obtained if the DNA "effective charge" is considered less than the bare charge by a fixed ratio q, considered here as a fitting parameter. The figure on the right shows a more recent  experimental test of the hydrodynamic theory emerging out of the Keyser Lab at the Cavendish. The Keyser lab has capitalized on an astoundingly simple (= cheap!) way of producing nanopores. They heat a glass microcapillary with a laser and use the traditional glass pulling technique to obtain a sharp tip. Internal diameters of 10-100 nanometers can be obtained in this way. The experiment shows the force signal as a trapped DNA is gradually pulled out of the pore. The force can be calculated using the lubrication theory [5,6] for electrokinetics and is shown by the red dots in the lower panel. 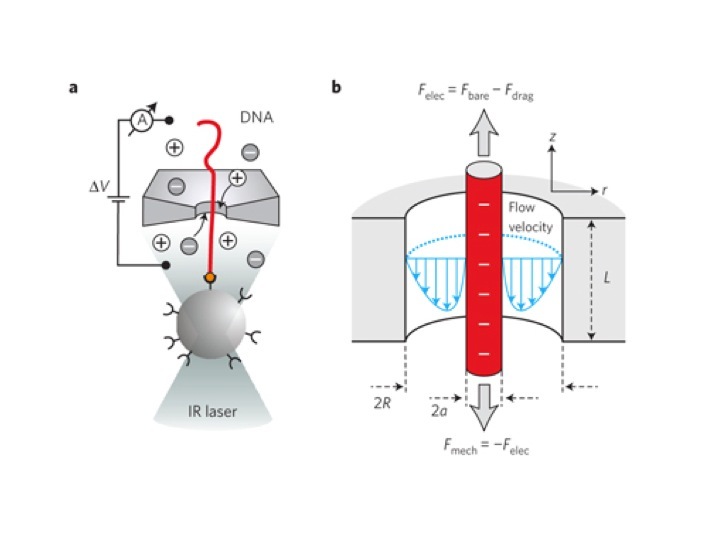 These experiments give us confidence that the principal resistive force in DNA translocation does indeed arise primarily from hydrodynamic drag in the pore region. The challenge now is to use this knowledge to evolve new tools for characterizing DNA such as the base sequence, interactions with proteins and fundamental questions related to the behavior of DNA as a charged polymer. This is still an open book with many exciting possibilities in basic science as well as in nascent technologies. Already, a new term is being used in this context "DNA Force Spectroscopy"! Acknowledgement: My research in this area has been supported by the NIH (USA) and by the Leverhulme Trust (UK).